Sugar Gliders that have been fed a proper diet, have a good home, and receive all the attention they need are healthy and happy pets. But even with proper care, sometimes illness or injury can occur. Some of the more common health concerns are listed below. Symptoms of calcium deficiency are lameness, paralysis, and difficulty moving. To prevent calcium deficiency, feed your glider calcium rich foods and provide a calcium supplement. Sugar Gliders may become constipated if not fed enough roughage in their diet. Symptoms are a hard distended stomach, difficulty defecating, and hard dry stool. Diarrhea can be from eating too much citrus fruit, stress, or other causes. Your pet can quickly become dehydrated and die if the problem persists and is left untreated. 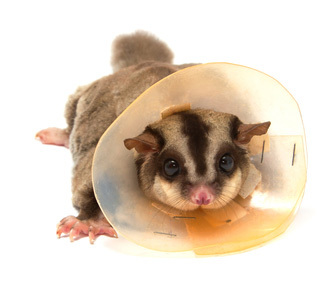 Your sugar glider may receive open wounds, torn claws, or broken bones from accidents and other unforeseen events. Veterinarian aid is advised for any severe injuries. Gliders fed a diet of fatty foods may become overweight. If your pet is overweight, reduce the amount of fatty foods in his diet. Sugar gliders of proper weight live happier and healthier lives. Parasites common to the sugar glider are ticks, mites, fleas, lice, roundworm, hookworm and tapeworm. Advice from a veterinarian is helpful in determining the correct treatment depending on the type of parasite. Stress can be caused by a poor diet, illness, dirty cage, a small or overcrowded cage, over-handling, loneliness, boredom, excessive heat or cold, or one of many other possible reasons. Symptoms may be loss of appetite, excessive eating, excessive sleeping, or frantically circling the cage..